It’s November, which in writing circles means its NaNoWriMo: National Novel Writing Month. I’m not attempting it myself this year, but I’d be remiss if I didn’t offer a little NaNoWriMo advice. Life is full of little ups and downs. You win some, you lose some. And other cliches as well. Some days the words come easy and some days it’s like pulling your own teeth out. The trick is getting to the point where the former is more common than the latter. You need to be able to produce content on the regular, reliably, if you want to produce any kind of body of work. That’s hard enough the other eleven months of the year, but it can be especially hard in November. When NaNoWriMo comes around and it feels like every writer in the world is doing it and racking up enormous word counts, it’s easy to feel a little discouraged. Especially if you’ve been struggling to write regularly. Personally, I’ve found that doing extreme writing challenges like NaNoWriMo really help my output but your mileage may vary. There’s something about the extra accountability, the public nature of it and the mass cheering on that happens that really helps be get stuff done. I’ve done three successful Camp NaNos and one successful main NaNo so far with more planned in the future. Hell, my debut novel, On The Rise, was mostly written during NaNo. The Whisper of the Leaves was a Camp NaNo project. Given that, most of my NaNoWriMo advice is just to give it a try. Not meeting the target word count by the end of the month doesn’t mean you’ve failed. Spurred on by my successesr at NaNo, I’ve also attempted a couple of other writing challenges, notably Story-a-Day and an attempt to write a text based video game in a month. I was hoping to replicate the kind of productivity I’ve seen during NaNo,but did I succeed at either of them? No. I’m not sure whether it’s because those challenges lacked the comprehensive progress tools of NaNoWriMo or if it was because no one else around me was really doing them, but I failed. I did not write a game in a month and I did not write a story a day for that challenge. When you set yourself a big challenge like that it can be tempting to view missing the target as an abject failure, but I don’t see it like that. Did I learn something new? Yes. Did I get something written? Yes. Did I end up with more words at the end of the month than I had at the beginning? Yes. Then as far as I’m concerned it was a rousing success. And as a bonus, I have a better idea of my strengths and weaknesses. I know what sort of challenges are best for me, which ones I can get the shiny certificate for, and that feeds back into my process. 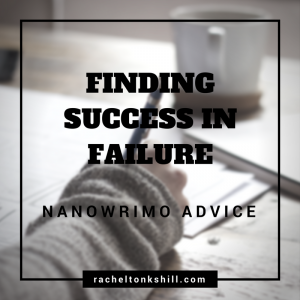 If you’re doing NaNoWrimo this year, my advice is to no be afraid to fail. Don’t let yourself get hung up on hitting 50,000 words and definitely don’t compare yourself to the people who manage that in the first weekend. The thing to remember about any writing challenge is that it’s a race against yourself, not others. I’m not doing NaNo this year, because I know that the hard target wouldn’t be good for me given the year I’ve had. But I am using the spirit of the month to try increase my productivity. My NaNoWriMo advice is that you treat it the same way, even if you’ve officially signed up. If you make it to 50k, great! If you don’t then you can still succeed if you’re still writing. And if you don’t write anything? That’s okay. Some months are hard and you deserve kindness from yourself. Pick yourself up and try writing again next month. I know this NaNo that as long as I’m writing, I’m winning. You can be a winner too.